Can the Corp play Shipment from Tennin on their first turn? No. The Runner does not have a last turn to reference. Ironically Shipment from Tennin may work best in a Tennin Institute: The Secrets Within deck because such decks need to prevent the runner from successfully running anyway in order to use the ID ability. From a practical perspective Shipment from Tennin saves you exactly one when advancing cards. That's powerful however since it means you can do install, shipment, advance and score a 3/1 or 3/2 agenda. With two of them you can even score a 4/2. Of course you can use those advancement counters for other things as well, advancing ice, a trap or a Ronin. But let's stay real, this is a card you include for fast advance. Although 3 influence is a decent cost to import I can imagine Shipment from Tennin to show up outside of Jinteki as well. In particular Weyland may have the ice to keep the runner out for a single turn and with the recent Jemison Astronautics: Sacrifice. Audacity. Success. wave of decks Weyland has branched out into fast advance. At the moment Jinteki can play four 3/2 agendas and three Medical Breakthrough which gives them six agendas they can easily score out of hand. 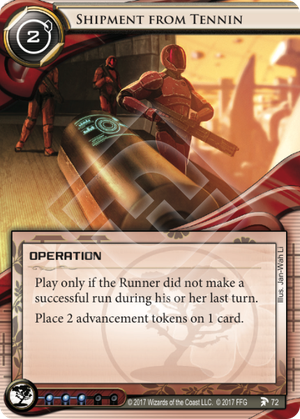 There is the downside of the runner cannot have made a successful run on their last turn. Fortunately, Jinteki have some dangerous ICE which makes the runner more cautious in the early game allowing you some chances to use Shipment From Tennin. Other than allowing you to fast advance agendas, the other big advantage with Shipment From Tennin is that it is so cheap. Other fast advance enablers such as Biotic Labor and SanSan City Grid will cost you 7-8 to score a 3/2 from hand. With Shipment From Tennin you can score a 3/2 from hand for only three credits - hardly giving up any tempo. At least until rotation occurs, this has opened up a new archetype - Jinteki Fast Advance.